From the moment you open up a new bag of your favorite coffee, the beans begin to lose their distinctive taste and character. 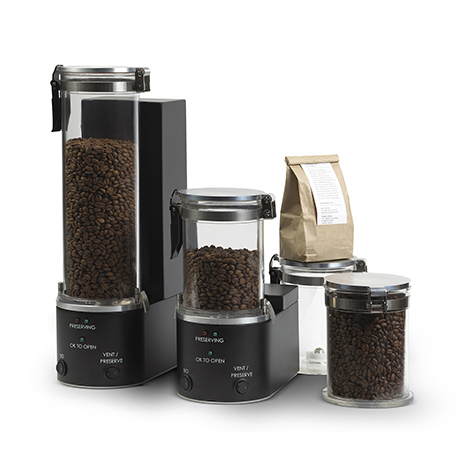 The Coffee Freshness System is the best option in coffee preservation and will keep your coffee tasting fresh longer. Why simply store your coffee, when you can preserve it? Using a carefully calibrated process our system enhances the environment your coffee is stored in by replacing the oxygen and moisture-laden air around the coffee with pressurized CO2 gas. This allows our system to effectively store coffee 2-3 times longer than traditional methods such as one-way valve bags or sealed glass jars. Unlike the pressurized cans that coffee is often sold in, our containers can be opened and re-pressurized as often as needed to keep your coffee fresh. This unique design also allows you to store many different types of coffee by using multiple canisters. Some of our customers have stored up to 5 pounds of coffee for longer than two months using multiple containers. The Coffee Freshness System utilizes a series of pump and purge cycles to flush the air out of the coffee canister and replace it with CO2 gas. Once pressurized our leakproof canister can maintain the preserving environment for months. Our system is designed with ease of use in mind and can be set up in minutes. Simply connect the base unit to your CO2 source of choice and attach the included coffee canister to begin preserving the flavor of your coffee.